You can now export Business Card information directly into Yahoo! Contacts with the click of a mouse! 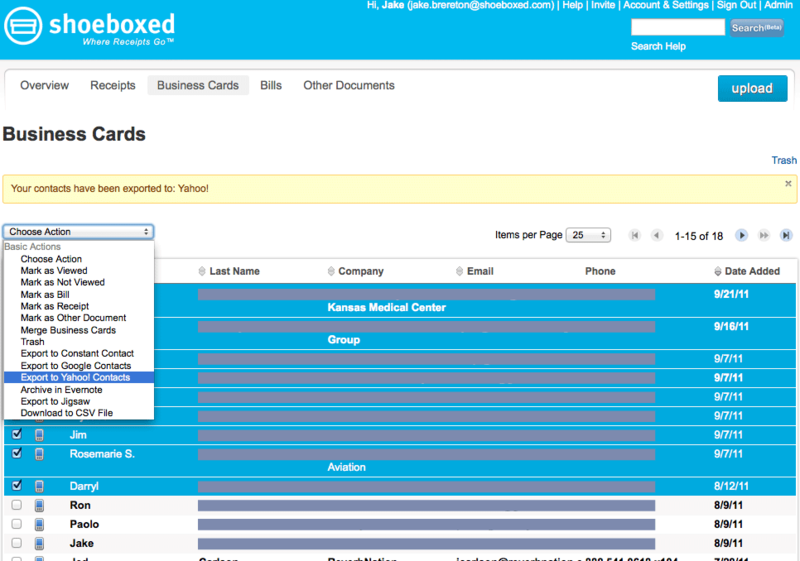 To begin your export simply select the Business Cards you wish to export, choose “Export to Yahoo! Contacts” from the drop-down menu and your contacts’ information will be sent directly to your Yahoo! Contacts list. You will be prompted by Yahoo to allow Shoeboxed permission to send the requested business card information, but only the first time you perform the export. And that’s it! The contacts you have exported will now be in your Yahoo! Contacts list. If you have any feedback or questions about this new feature please reach us 24/7 at help@team.shoeboxed.com or give us a shout on Twitter @Shoeboxed. Stay tuned as even more upgrades and fun new features are released! Squirrels and Llamas and Camels, Oh My!